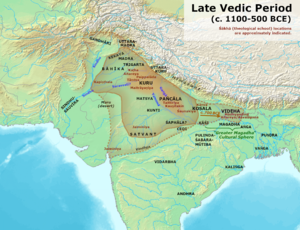 The Vedic period (Vedic age) c. 1500 – c. 600 BC is a period in the history of the Indian subcontinent between the end of the Indus Valley Civilization, and about c. 1200 BC. It gets its name from the Vedas, which are religious texts. They do contain some details of life during this period. They are the main sources for understanding this period. The Vedas were composed and orally transmitted by speakers of an Old Indo-Aryan language. They had migrated into the northwestern regions of the Indian subcontinent early in this period. 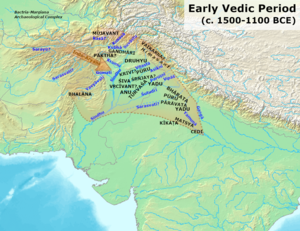 The associated Vedic culture was tribal and pastoral until c. 1200 or 1100 BC, and centred in the Punjab. The society then spread eastward to the Ganges Plain, becoming more agricultural and settled. The Vedic period saw the emergence of social classes, and developed into kingdoms known as the Janapada. Archaeological cultures show phases of Vedic culture such as the Ochre Coloured Pottery culture, the Gandhara Grave culture, the Black and red ware culture and the Painted Grey Ware culture. ↑ McClish, Mark; Olivelle, Patrick (2012), "Introduction", in M. McClish; P. Olivelle (eds. ), The Arthasastra: selections from the classic Indian work on statecraft, Hackett Publishing, p. xxiv, ISBN 1-60384-903-3 : "Although the Vedas are essentially liturgical documents and increasingly mystical reflections on Vedic ritual, they are sufficiently rich and extensive to give us some understanding of what life was like at the time. The earliest of the Vedas, the Ṛgveda Saṃhitā, contains 1,028 hymns, some of which may be as old as 1500 BC. Because the Vedic texts are the primary way in which we can understand the period between the fall of the IVC (ca 1700) and the second wave of urbanization (600 BC), we call the intervening era of South Asian history the 'Vedic Period.'" ↑ Witzel, Michael 1995. Early Sanskritization: origins and development of the Kuru state. Electronic Journal of Vedic Studies, 1 (4): 1–26. ↑ Samuel, Geoffrey 2010. The origins of yoga and tantra: Indic religions to the thirteenth century. Cambridge University Press. ↑ Witzel, Michael 1989. Tracing the Vedic dialects. In Dialectes dans les litteratures Indo-Aryennes ed. Caillat C. Paris, p97–265. This page was last changed on 20 April 2018, at 15:18.